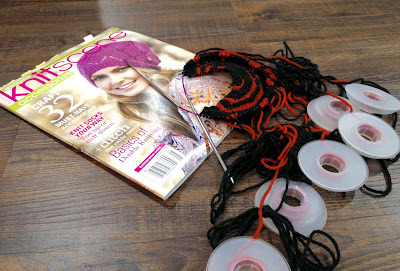 A blogger's adventure with knitting, embroidery, cross stitch, and other crafty goodness. Blankets, blankets, blankets. How many blankets can one person make at a time? This Wednesday I'm going to introduce my new project that I just cast on this past week. It's a beautiful shawl from the 2014 Accessories edition of Knitscene magazine. This is the Dressel Shawl by Megi Burl. It's available to purchase in the Interweave store. If you don't happen to have the magazine I highly suggest you try to find it because there are some great patterns in it. In the pattern, they suggest using Knit Picks Stroll Sport but unfortunately it has been discontinued. As an alternative I have substituted it for Knit Picks Wool of the Andes Sport. It's 100% Peruvian Highland wool so it's not as soft as Stroll's merino wool, but it'll keep you nice and toasty warm in the winter. 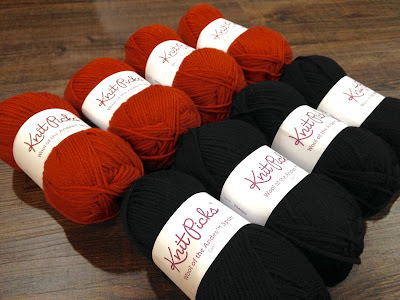 Megi uses a vibrant orange called Pumpkin in Stroll, but Wool of the Andes Pumpkin is very muted so I went with a red-orange shade called Saffron. Also, I was afraid that if it was too orange then it would look too halloween-ish (which might be appropriate this month but not so much in January). The other shade is black but in Wool of the Andes it's Coal. It appears this shawl combines many different techniques so I might not suggest it for a beginner, unless you're feeling daring. From what it appears, it includes color work, intarsia, and picking up stitches and knitting side ways. This is actually the first time I've ever done intarsia. I'm not a fan of all those tangles of string hanging every which way while I'm trying to hold tension and switch and twist colors, but the results look good. I'm finally using my bobbins that I bought like 3 years ago. I don't have enough for every strand but at least I can use them for every other strand. Since my niece should be born a month from now I'm feeling the pressure to finish her gray and white chevron blanket. I really want to make a hat with matching mittens and booties for her also but I'm running out of time. This shawl will probably get pushed to the side for awhile until I get her projects done. I would love to make a dress or sweater for her but that can be saved for Christmas. Then again, Christmas is right around the corner! If only I could knit all day instead of working. Maybe I should get a lotto ticket. A knitter can dream. Looking good! Looks complicated too with all those strands! Good luck - look forward to seeing it finished! Thanks! It definitely requires my full attention. 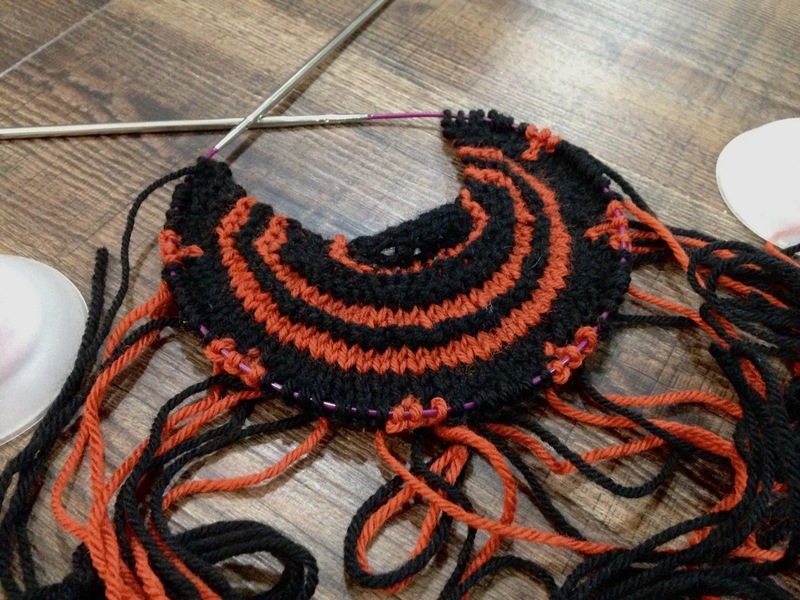 No tv while knitting this up. I am a knitter and crafter living in New York with my loving and creative husband. I enjoy knitting, crochet, embroidery, cross stitch, sewing and other creative outlets. This blog is a way for me to share what I love to do and I hope I can inspire others, as many other bloggers have inspired me!